Tag line: "Fear will consume you"
The Cannibal Films of the ‘70s and ‘80s (such as The Man from Deep River, Jungle Holocaust, and, of course, the granddaddy of them all, Cannibal Holocaust) were notorious for their violence, some of which was very real. 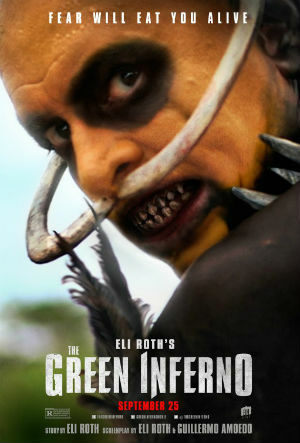 With The Green Inferno, writer / director Eli Roth succeeds in bringing the subgenre into modern times without diluting its shock value, giving his audience plenty of the blood and gore that made these earlier films so infamous while, at the same time, providing us with characters and situations that fit neatly into the 21st century. College freshman Justine (Lorenza Izzo) develops a crush on Alejandro (Ariel Levy), the leader of the University’s activist organization. After being urged by Jonah (Aaron Burns), himself a member of Alejando’s team, to attend the group’s meetings, Justine slowly starts to believe in their causes, and even agrees to accompany them to Peru, where Alejandro, Jonah, and the others, including Kara (Ignacia Allamond), Lars (Daryl Sabara), Amy (Kirby Bliss Blanton), Samantha (Magda Apanowicz), and Daniel (Nicolas Martinez), intend to thwart a company’s plan to destroy a large portion of Rainforest, which will leave an entire indigenous tribe with no place to call home. Ignoring the warnings of both her father, a lawyer for the United Nations; and her roommate Alyssa (Sky Ferreira), Justine flies to Peru, full of hope that the mission of mercy she and the others are undertaking will be a success. What they find instead is a nightmare, and many of them will never wake from it. In most cannibal movies, the poor souls who venture into the jungles of South America do so blindly, and deserve what they get. The film crew in Cannibal Holocaust features some of the most despicable characters in horror history, and even the twentysomethings in 2007’s Welcome to the Jungle are so idiotic that it’s hard to give a damn what happens to them. The young men and women in The Green Inferno, however, are somewhat different in that their intentions are good (well, most of them, anyway; from the moment he first appeared on screen, I knew Ariel Levy’s Alejandro was going to be an insufferable prick). That said, they are definitely naïve: even during such throwaway moments as the rickshaw rides, you get a sense that these kids are way out of their element, and heading for a world of trouble they aren’t prepared to face. Yet, thanks to the performances of the film’s young cast, we admire both the characters and their motives, which makes the later scenes all the more difficult to watch. It’s to Roth’s credit that well before the cannibals turn up, The Green Inferno has already dragged us to the edge of our seats. The sequence when the kids stage their Peruvian protest is absolutely nerve-wracking, as is the plane crash that soon follows it. Thanks to these scenes, the audience is already on pins and needles when the gore and barbarity take center stage, and as a result the movie's second half is almost too much to bear. The Green Inferno does have its problems. I could have done without the entire marijuana scene (boy, did that feel out of place), and a sequence hinting at female genital mutilation (which is first brought up early on, when Justine is attending a college lecture on the subject) struck me as an unnecessary detour. Also, Roth’s late attempt to generate sympathy for the native tribe fails miserably, mostly because he’s already dedicated a large portion of the movie to building up our animosity towards them. Still, The Green Inferno is both slick and unflinching, and contains enough blood and guts to satisfy even the most insatiable gore hound. And, perhaps most welcome of all, the movie does justice to the Cannibal films of old without getting caught in some of the subgenre’s more unfortunate pitfalls (Though I can’t say for certain, I don’t think any animals were harmed during the making of this movie). I mostly liked this one, too. But the marijuana scene (and the masturbation scene as well) seemed awfully out of place, as you said. Some day Roth will grow up a bit (I hope) and blow us all away.